An effective pain management program needs to be broad based. No single medication or method is effective in all pain situations. Too often, animal patients are only given NSAID medications. Too often the medications chosen are not well matched to the pain condition or the doses of medications are inadequate for the level of pain present. In order to achieve adequate pain control (especially initially), some patients may require extended intravenous infusions of key pain blocking agents, and/or epidural (spinal) injections of pain relievers, and most patients do best when a combination of oral medications is used, tailored to the patient's individual needs and responses to treatment. 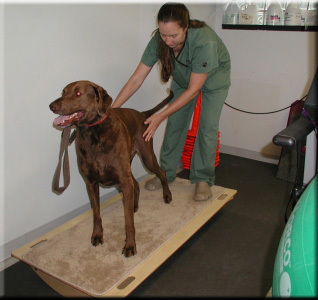 Most patients accept these treatments very well, and we work with you to find a strategy that is not only effective but also one that you can manage and that your pet will readily accept. Pain medications must be carefully matched to any other disease conditions present. Flexibility is the cornerstone of our program. Physical Therapy (PT) is a critical element in human pain and injury management. Physical Rehabilitation Therapy (PRT) provides these same tools to management patient pain and dysfunction. PRT often allows us to reduce or eliminate pain medication for chronic pain patients. We incorporate PRT methods into every situation possible to improve the recovery rate and maximize the degree of patient function. Our goal is not just to have the patient do "OK"; we want our patients to resume all of their activities of daily living (ADLs). 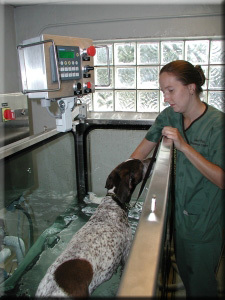 We offer Underwater Treadmill (UWTM), Land Treadmill, E-stim Whirlpool, Ultrasound Therapy, Laser Therapy, TENS, NMES, as well as a rich assortment of land based options. We work with you to develop an effective Home Exercise Program (HEP). In addition, we conduct a detailed review of the Home Environment as well as a review of the appliances that can be used to maximize your pet's function while helping to reduce the risk of owner injury. PRT should be a comprehensive program combining aquatic and, quite critically, non-aquatic office based modalities along with home modifications and exercise programs. 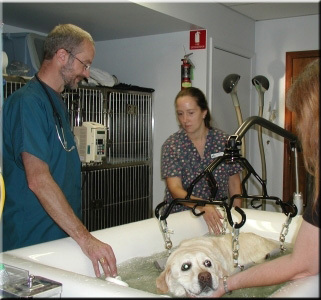 PRT is not simply getting your pet into a pool or UWTM. Laser therapy alone is NOT effective pain management. Myofascial disease is the most overlooked, underappreciated aspect of patient management whether the condition is pain, weakness, or a combination of both. Muscle often becomes the most important persistent pain generator for chronic pain patients. Causes include injury, disuse, and overuse. Portions of the muscle belly, the subunits we call sarcomeres, become locked into very tight bands. Trigger points are the focal point of disease within those band. The net result is that the muscle becomes weaker and it generates pain within the taut band as well as referred pain generated through sensitization of the central nervous system. The most effective treatment for myopain involves needle therapy. 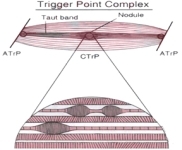 Needle therapy is the key that unlocks the trigger points within the taut muscle bands. 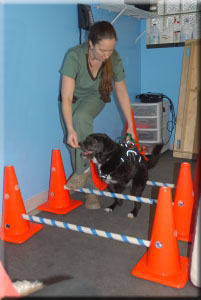 Dr. Stein is only the 2nd veterinarian in the US to be certiified as a Myofascial Trigger Point Therapist (CMTPT) by the Janet G. Travell, MD Seminar Series in Bethesda, MD. Traditional Chinese Veterinary Medicine (TCVM) is steeped in a long history and tradition. There are many pain, paralysis, and cancer patients that either have no good treatment option through conventional western medicine channels or the options available are judged to be too risky or too expensive. Many patients fail to tolerate western medications. Many patients have disease conditions that prevent the use of many western medications. 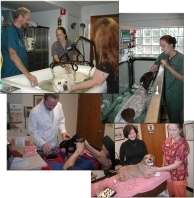 TCVM provides for the care of these important patients. Acupuncture, electroacupuncture, and aquapuncture coordinated with Chinese herbal therapy often provides dramatic relief for difficult pain, weakness, and cancer patients. Advanced anesthetic methods are a natural extension of an advanced pain management program and a key aspect of our practice. Over the past fifteen years we have incorporated extremely sophisticated management techniques into our anesthetic safety program. Whether a patient has kidney disease, heart disease, or is simply very old, by focusing on safety details we can improve the likelihood of a successful outcome. Every patient has detailed monitoring in place including dual blood pressure, pulse oximeter, ECG, and end-tidal CO2 monitors. Direct arterial and central venous blood pressure monitoring is a very advanced monitoring option routinely employed at our practice. Every patient has a dedicated staff member monitoring their anesthesia. Multi-level blood pressure support is available at the patient's side. 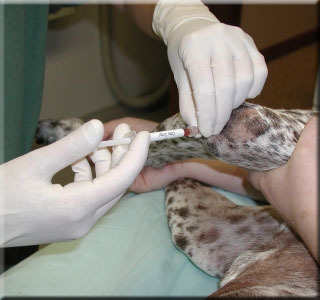 We provide advanced anesthesia support at our practice and we have the option of providing advanced anesthetic support at your normal veterinary practice. One of the most difficult and the most painful decisions is that decison about when we have to let our beloved pets go; when their quality of life has diminished to the point that they are suffering unnecessarily. 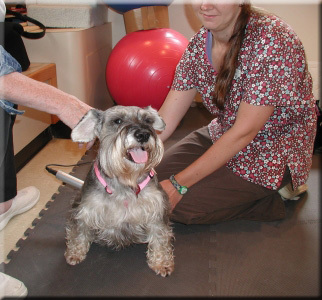 By combining the best elements of pain management, PRT, cancer management, and the balance of acupuncture and herbal therapy we can provide a unique opportunity for your pet to enjoy significant additional time with the family.